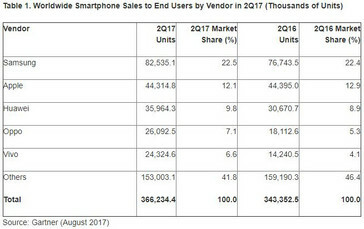 Sales figures by analytic firm Gartner imply that there are nine devices running on Android for every one running on iOS. 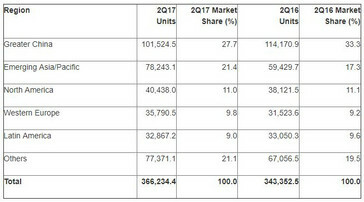 Samsung leads the smartphone market comfortably, with Apple coming in second and Huawei a close third. The battle between the Android and iOS ecosystems has always been a thrilling one but it's getting a bit one-sided, as sales numbers put the Android market way over its iOS counterpart in the mobile world. Statistics by analytic firm Gartner has shown the Android OS to have a whopping 87.7% market share, with Apple-branded products coming in second at just 12.1%. 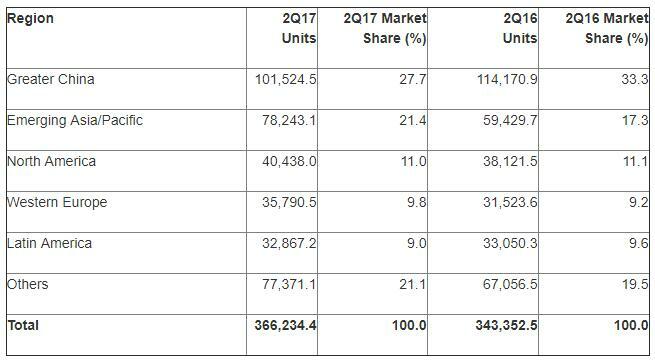 Samsung is still the largest smartphone manufacturer in the world, with 85.2 million units shipped in Q2 2017 accounting for a 22.5% global market share. Those are improvements over the 76.6 million shipments and 22.4% market share, which is a testament to the rise in the number of Android shipments over the past year. Apple comes in second, its 44.6 million shipments in Q2 accounting for a 12.1% market share, a drop from a 12.9% figure last year. It's an expected lull in sales, though, as the iPhone 8 is still in the works. Chinese giants Huawei are the third largest smartphone company around, with 35.9 million shipments and an accompanying 9.8% market share ensuring that they're only half a step behind Apple. Considering the fact that they recorded 30.6 million shipments and an 8.9% market share a year ago, it wouldn't be surprising to see them take the second spot in the near future.